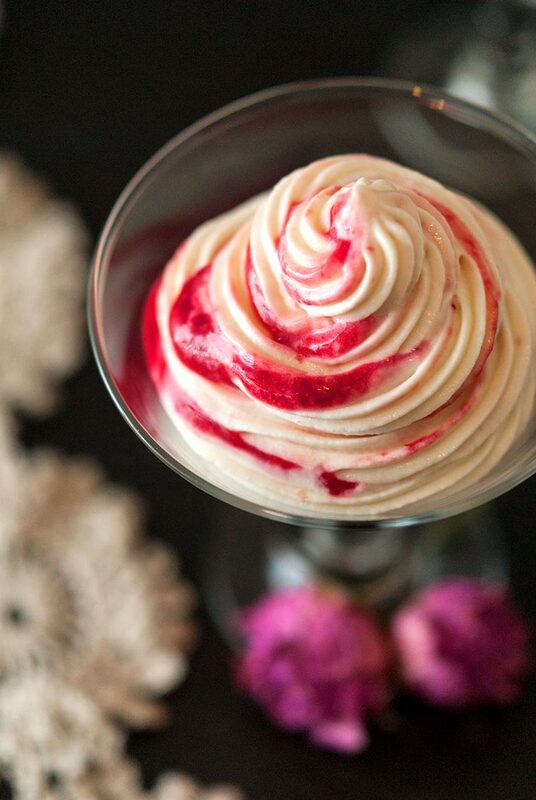 This no-bake, creamy, decadent white chocolate cheesecake mousse recipe is ribboned with raspberry-rosemary compote. It’s gluten-free, silky and sweet, tart and delicately hinted with rosemary essence. It’s one of the simplest and prettiest desserts to serve at a dinner party, baby shower or bridal shower. It’s also perfect for Valentines Day! The nicest thing about this lovely dessert is that you can make it days ahead of serving, so there’s no fussing in the kitchen at the dinner party. I’ve served it 5 days after it’s been sitting in the fridge, but it only actually needs 4 hours to set. 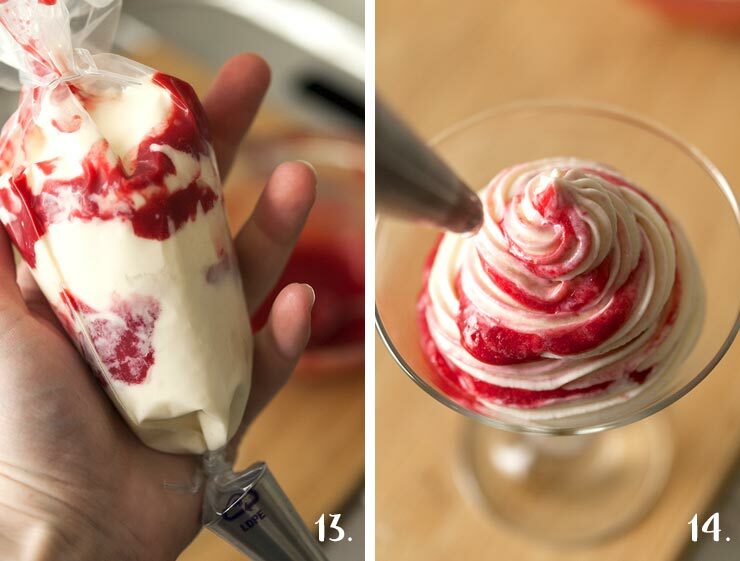 Simply make it 4 hours or more before your party and store it in a pastry piping bag (detailed directions below). 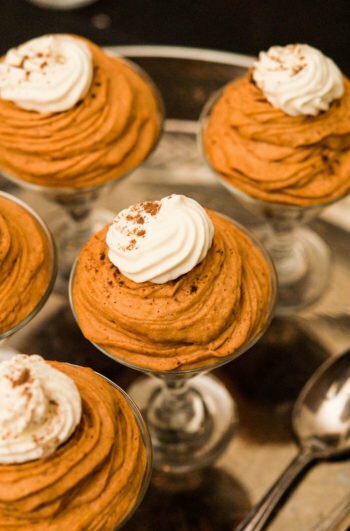 Pipe into your pretty glasses either before your guests arrive, or right before dessert! A little bit goes a long way, so you don’t need to make large servings. Less is more. That’s why I like to serve this mousse in tiny cordial glasses or small tea cups with a few macrons on the side. Especially after a big dinner, these small mousse cups are all you need to make your guests perfectly full and happy. It really makes them look so much prettier. 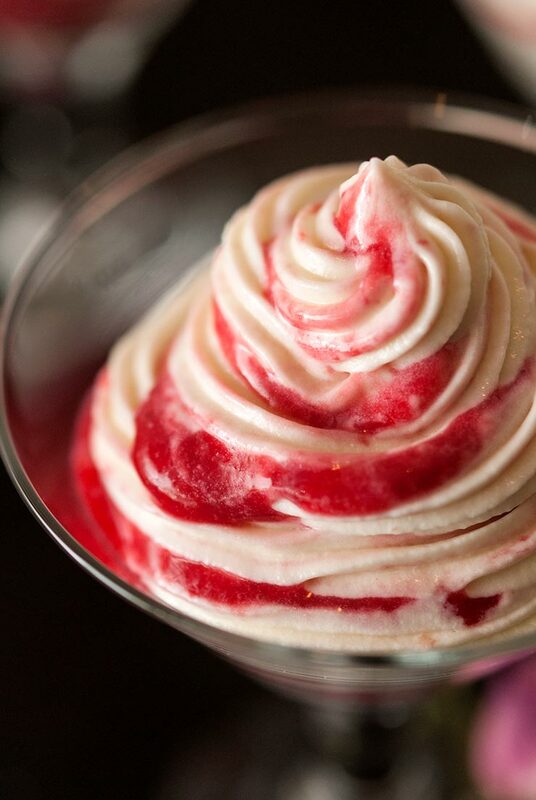 Not to mention, you can’t get that pretty swirl of raspberry if you spoon them into the glasses. To make this dessert extra fancy, you might as well splurge on Godiva or another high-quality brand of white chocolate. Or at least, make sure your white chocolate is fresh and hasn’t been sitting in the baking cupboard for a while. Otherwise, the chocolate will be gritty and give your mousse a not-so-nice texture. 1. Can you use frozen raspberries? Sure! They’ll work just as well as fresh raspberries, but they might release more liquid than fresh strawberries when cooked down. If you notice your compote is very runny, you may want to allow it to reduce in the sauce pan for an extra 5 minutes. 2. How long does this recipe take to make? The whole recipe takes a half hour to make and 4 hours to set. The raspberry-rosemary compote takes about 15 minutes to make, the white chocolate cheesecake mousse also takes about 15 minutes, then everything takes about 4 hours to set in the fridge. 3. How long will it last in the fridge? 1. In a sauce pan, pour 8 oz. of raspberries, 1 tsp. fresh rosemary (leaves of 3 or 4 sprigs) and 1½ tbsp. sugar. Turn on a medium flame. 2. Break the raspberries apart with a spoon while they simmer with the sugar. After about 3 minutes, lower the heat to low, and allow the berries to simmer, bubble and reduce for 10-15 minutes, stirring occasionally. 3. Spoon raspberry mixture into a small mesh strainer over a bowl and press the compote through the strainer to separate it from the seeds and rosemary. 4. When you’re done, your compote should be semi-gel-like. If it’s runny like juice, give it 5 more minutes to reduce in your sauce pan. If it’s still not quite a gel-like texture, add 1-2 tsp. of corn starch to thicken it up a bit. Cover with cellophane and place in the fridge. The sweetness of your raspberries actually determines how well the compote gels while simmering with sugar. The sweeter (riper) the berries, the less easily they’ll gel… that’s why it’s not an exact process. 5. Add 1 cup of chocolate to a double boiler, or simply place it in a glass pyrex measuring cup in your sauce pan. Add a small amount of water to the pan and turn the heat to medium. Allow the chocolate to melt while you prepare your other ingredients, mixing occasionally. NOTE: don’t allow any water to get into the chocolate! If you do, the consistency can quickly turn to a gritty, inedible texture. 6. Add 1 cup heavy whipping cream to a mixing bowl and use a hand mixer (or add to a standing mixer) on a high setting to whip the cream until thick. You’ll know it’s ready when small peaks form when you lift the beaters. 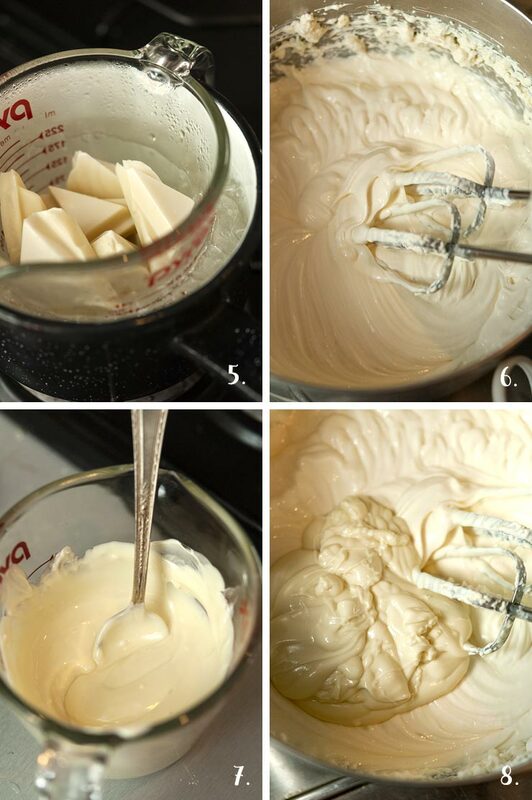 Once cream is whipped, add 12 ounces of whipped cream cheese, 1½ tbsp. real vanilla extract, and 1 tsp. sugar. Mix ingredients thoroughly. 7. When you’re chocolate is finished melting (it takes about 10 minutes) give it a nice stir and make sure no chocolate is unmelted. 8. Add melted chocolate to your mixing bowl and mix all ingredients together thoroughly. Once mixed, place in a container with a lid and refrigerate for at least 4 hours. 9. 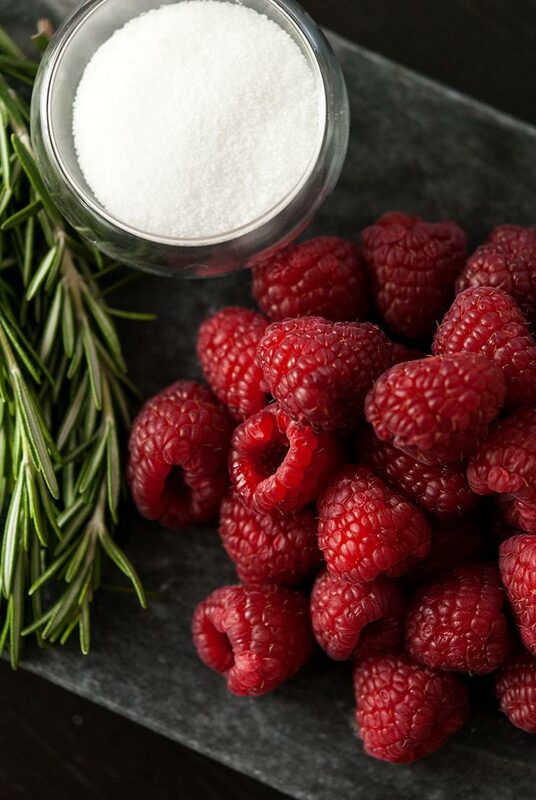 Once your mousse is set, it’s time to combine it with the raspberry-rosemary compote! Place your pastry tip in the pastry piping bag and seal the bag shut with a twisty tie just above the tip. You’re going to be pressing the white chocolate mousse into the bag, and you don’t want it to come out just yet. 10. Fold the top of the bag over a little (this makes things less messy when you’re ready to squeeze the bag), and place in a large cup or mason jar to keep it standing up. 11. Add a heaping tablespoon of mousse to the bag and push it all the way down to the bottom with a spoon. 12. Place the bag back in your jar and spoon in a teaspoon of raspberry-rosemary compote, making sure it’s spread over the mousse. You can be a little sloppy here. It makes for a nicer marbling. 13. Repeat the process by adding another heaping tablespoon of mousse, then a teaspoon of compote in layers until you fill your bag. 14. 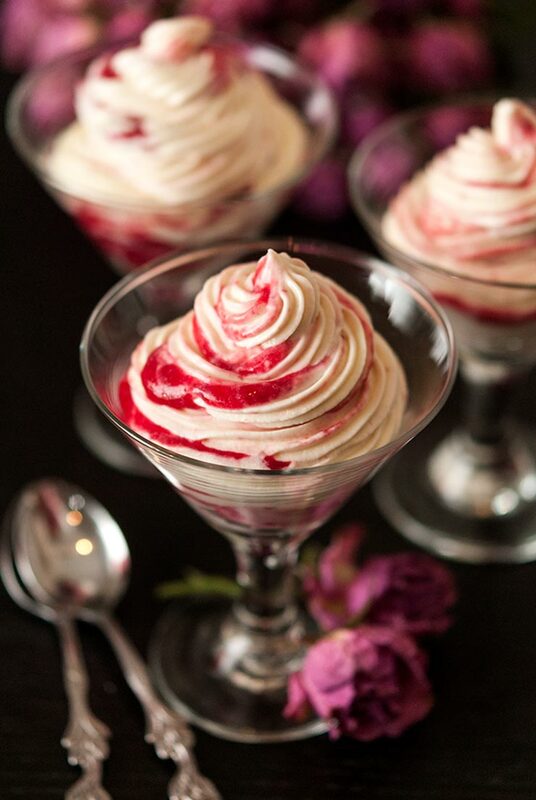 You can either seal the top with a twisty tie and place your bag back in the fridge for when you’re ready to serve, or remove the bottom twisty tie and fill your lovely glasses with the gorgeous and incredibly delicious white chocolate cheesecake mousse with luscious raspberry-rosemary compote swirls! Note: Once you’ve filled your glasses, you’ll either want to serve them right away or put them back in the fridge because they’ll melt down a bit and won’t stay as firm after about 15 minutes. 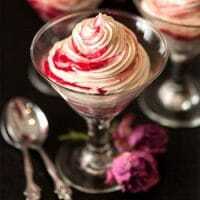 This no-bake, creamy, decadent white chocolate cheesecake mousse recipe is ribboned with raspberry-rosemary compote. It’s gluten-free, silky and sweet, tart and delicately hinted with rosemary essence. 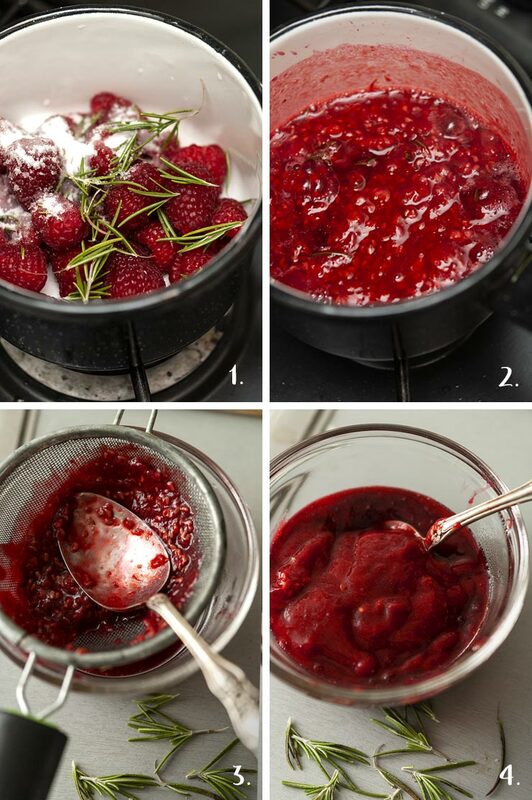 In a sauce pan, pour 1 cup of raspberries, 1 tsp. fresh rosemary and 1½ tbsp. sugar. Turn on a medium flame. Break the raspberries apart with a spoon while they simmer. After about 3 minutes, lower the heat, and allow the berries to reduce for 10-15 minutes, stirring occasionally. Spoon raspberry mixture into a small mesh strainer over a bowl and press the compote through the strainer to separate it from the seeds and rosemary. Cover with cellophane and place in the fridge. 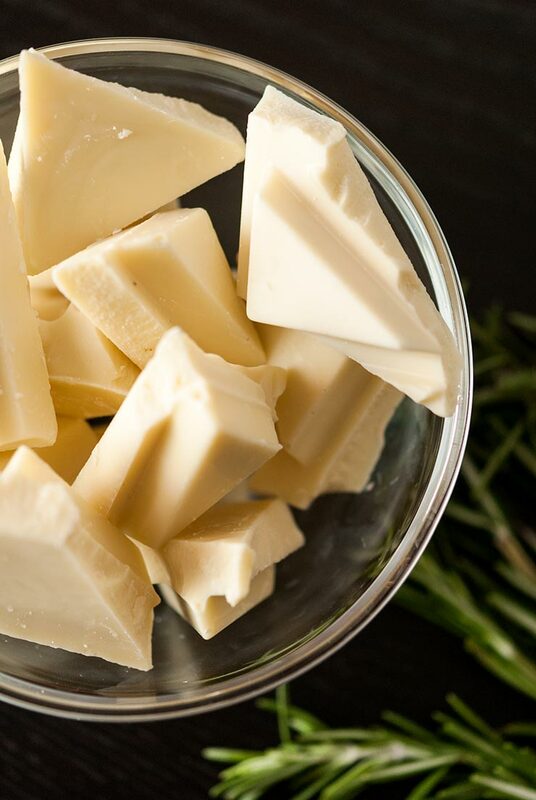 Melt 1 cup of white chocolate. While it melts, prepare your other ingredients, mixing chocolate occasionally. (See instructions above if you're not sure how to properly melt chocolate). Add 1 cup heavy whipping cream to a mixing bowl and use a hand mixer (or add to a standing mixer) on a high setting to whip the cream until thick. You’ll know it’s ready when small peaks form when you lift the beaters. Once cream is whipped, add 12 ounces of whipped cream cheese, 1½ tbsp. real vanilla extract, and 1 tsp. sugar. Mix ingredients thoroughly. When you’re chocolate is finished melting (it takes about 10 minutes on the stove) give it a nice stir and make sure no chocolate is unmelted. Add melted chocolate to your mixing bowl and mix all ingredients together thoroughly. Once mixed, place in a container with a lid and refrigerate for at least 4 hours. Once your mousse is set, place your pastry tip in a pastry piping bag and seal the bag shut with a twisty tie just above the tip. 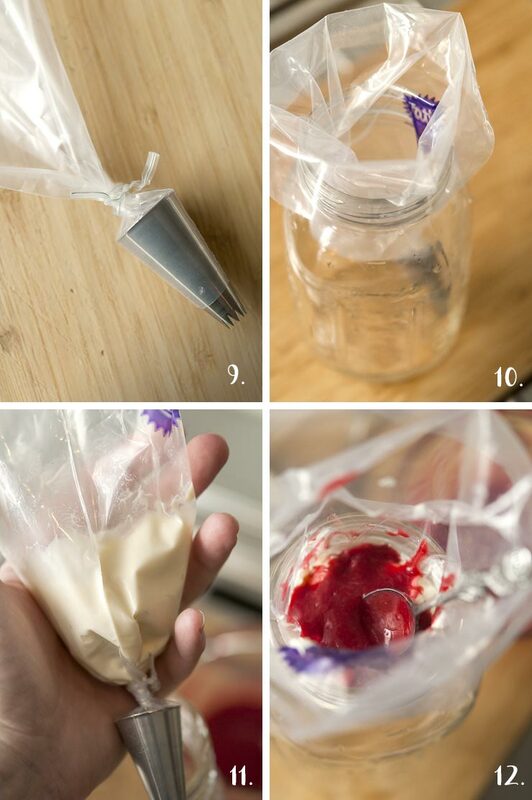 You’re going to be pressing the white chocolate mousse into the bag, and you don’t want it to come out just yet. 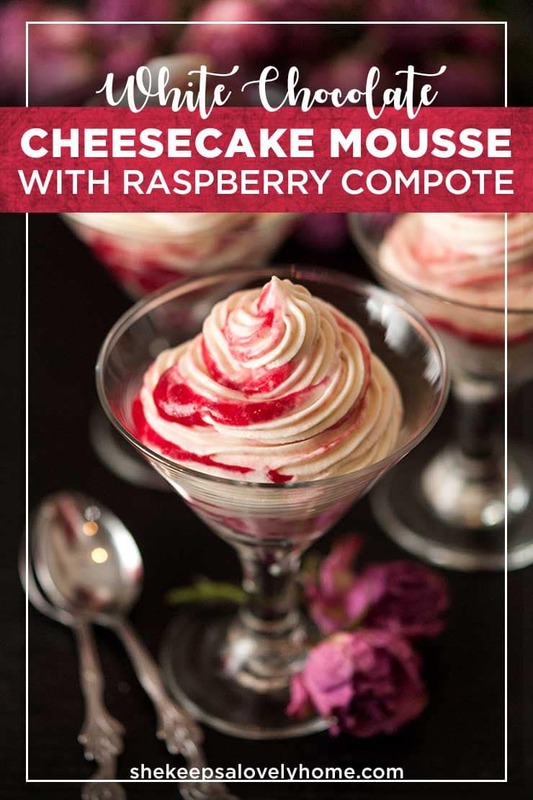 Add a heaping tablespoon of mousse to the bag and push it all the way down to the bottom with a spoon, then spoon in a teaspoon of raspberry-rosemary compote, making sure it’s spread over the mousse. You can be a little sloppy here. It makes for a nicer marbling. Repeat the process by adding another heaping tablespoon of mousse, then a teaspoon of compote in layers until you fill your bag. You can either seal the top with a twisty tie and place your bag back in the fridge for when you’re ready to serve, or remove the bottom twisty tie and fill your lovely glasses.